Ayr Chartered Accountants do a runner! TWO intrepid Ayr-based businessmen are in training for one of the world’s biggest long-distance races. 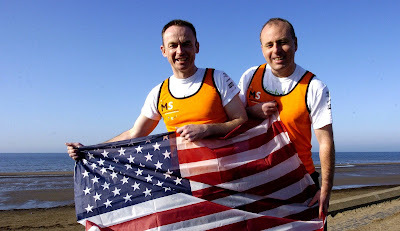 Andrew Sinclair (43) and Stephen Wilkie (39), partners in leading Ayrshire Chartered Accountants Sinclair Scott, will be lining up at the start of the famous New York City Marathon on Sunday 2 November. The New York City Marathon is one of the world’s great road races, drawing more than 100,000 applicants. The race attracts many world-class professional athletes, not only for the more than $600,000 in prize money, but also for the chance to excel in the media capital of the world before two million cheering spectators and 315 million worldwide television viewers. As any one of the more than 700,000 past participants will attest, crossing the finish line in Central Park is one of the great thrills of a lifetime. Andrew and Stephen will be running in order to raise funds for the Multiple Sclerosis Society Scotland. The Multiple Sclerosis Society Scotland is Scotland’s largest charity for people affected by multiple sclerosis, and is part of the MS Society of Great Britain and Northern Ireland. About 10,400 people in Scotland have MS. Businesses offering over £125 will have their logo displayed in the reception hall of the Sinclair Scott offices in Wellington Square, Ayr, and contributors of £500 or more will in addition be given the opportunity of a special feature page on the Sinclair Scott website. For more information contact Andrew or Stephen on 01292 288999.